When I made a comeback to Airsoft I noticed that most players these days use simple protective classes without any cover for their faces. 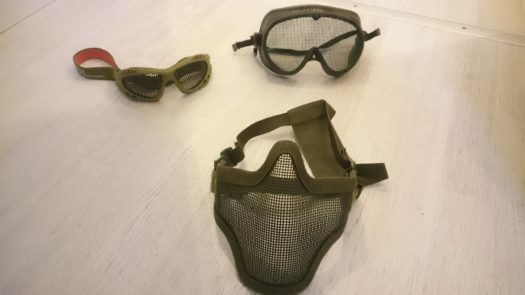 Back in the day when I started playing airsoft pretty much everybody was using either Sansei airsoft masks with steel mesh goggles or paintball masks. This felt natural since getting a burst of BBs from a high power AEG in to your face can be very painful and potentially dangerous to your teeth. The reason many people prefer clear tactical glasses or goggles is the unobstructed field of view and the ease of breathing and communication. This however comes at a price. When compared to mesh goggles the clear glasses fog up easily especially if you sweat a lot from your face. The other downside is there is no protection for your face. While this is not that dangerous it can be very painful and you can end up with bruised face for a couple weeks if you get hit bad. An airsoft BB can also easily chip a tooth even from a distance if your mouth is open and you get a direct hit. I’ve seen this happen. I have also seen a BB stuck under the skin of a cheek. It ain’t pretty. I actually tried using tactical glasses at the beginning of my comeback but I soon reverted back to using mesh goggles with a mesh mask to protect my face. Part of my day job is customer service so I can’t risk having bruises on my face and I really don’t like the thought of chipped teeth either. So today I will discuss about the best airsoft face protection and how you can effectively and comfortably protect your face and teeth in airsoft. IMPORTANT: I would like to point out that safety gear is the last thing you want to save your money on. A quality set of eye protection and a face guard will cost you less than $50 and they are pretty much indestructible. There are cheap hardware store eye protection and mask available but I can’t recommend getting something like that. There have been reports with cheap Chinese metal mesh masks cracking from BB hits and clear plastic goggles cracking from normal AEG hits. You have only one set of eyes so please don’t make uninformed decisions when choosing your protection. In Airsoft safety always comes first. So please get your protective gear from a well-known manufacturer and supplier. 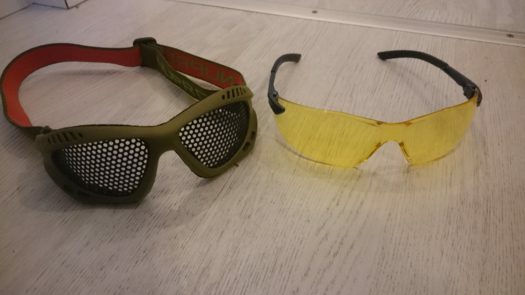 Most airsoft stores only carry tested quality masks and glasses so airsoft store are in general a safe place to buy your face protection. 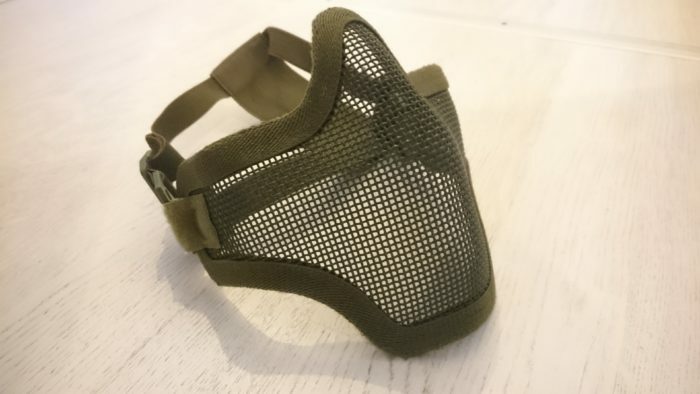 There are a few options to choose from if you want to protect your face in airsoft. The BBs have relatively low kinetic energy so it doesn’t take much to soften the impact enough to protect you from bruises. A simple balaclava or a scarf will offer some protection but fabric won’t completely stop the BB and you can still get stung badly. That’s why I recommend using solid face protection. You have basically two options. Option one being a complete mask with eye protection and full face cover. This means your typical paintball (or paintball style) mask or a lighter airsoft mask. The paintball style masks usually have the greatest level of protection and usually cover also your ears and parts of your neck. The airsoft style masks usually just cover your eyes, forehead, cheeks, nose and mouth. The other option is to use separate eye protection and face protection. This offers a lot of different options depending on your preference. If you decide to go the full mask route, my recommendation would be an airsoft mask with steel mesh eye protection. The steel mesh will slightly obscure your vision but once you get used to it, it really isn’t a problem. What you get in exchange is complete freedom from fogging up your vision no matter what the weather is like. The only downside in my opinion is the theoretical change of a BB fragment penetrating the mesh and hitting your eye. I want you to be aware of this risk but in all my years playing airsoft I have never seen this happen. I have once read about it happening but even in that case the fragment didn’t cause any injuries, so I figure it’s a pretty safe bet to say mesh goggles are safe. IMPORTANT: What I stated in the previous paragraph only applies to quality mesh goggles. There are cheap and dangerous ones on the market. If you have any concern about the quality of mesh goggles you, or some of your friends is using, ALWAYS test the eye protection with the most powerful weapon on the playgrounds. If you however decide you want to go with the paintball mask style make sure you get something with quality glasses that are well ventilated. This will keep you vision clear and save from a lot of frustration. Some mask can also make breathing a bit more difficult especially when breathing heavy while sprinting. This can be avoided by choosing a mask with good ventilation or by drilling small holes to the mask to increase air flow. Masks can also muffle your voice a bit which can make communication more difficult. This is what I prefer to do myself. You can use pretty much any kind of eye protection with the face guards. It will work with clear goggles and glasses or with mesh goggles and glasses. I actually use either the mesh goggles from my circa 1996 Sansei Airsoft mask that is still going strong or a set of Nuprol Pro mesh goggles. The face guard I like to use is a Nuprol mesh one. I don’t really have anything bad to say about it. It’s flexible enough so you can contour it to fit to the shape of your face and I have had no problems with breathing or anything else really while wearing it. So that’s pretty much all that there is to know about the best airsoft face protection available. As always drop a comment below if you have any questions and I will get back to you soon! Great post! My teenage son has been begging me to play airsoft at the place by our home. To be honest, it scares the crap out of me! I’m glad I read this article so I know more about how the protective gear will keep him safe. There is no real danger in airsoft as long as the common safety protocols are taken into consideration. That’s why I recommend beginners get in touch with their local airsoft scene or organization that can show them the ropes so to speak. In all honesty airsoft is a lot safer than sports like ice hockey or football as long as eye and teeth protection is taken care of. Great Post. I am an athletic person and I am always looking for sports to be apart of. The only gun game I played was lazer tag. That was very fun. I was afraid to play paint ball with my friend when I was younger because the pain balls were so fast. I also did not have any gear at all.